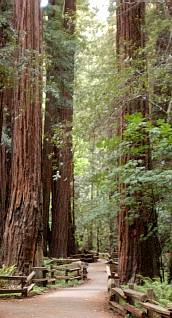 • Muir Woods National Monument is located in California Marin County just across Golden Gate Bridge from San Francisco. The park occupies one of the Mount Tamalpais valleys. It is known for the magnificent coast redwood forest. The narrow flat valley winding along Redwood Creek between 1000-years old giant redwood trees is a magic place. Here is the • Virtual Walking Tour of the woods. It has many redwood forest pictures. You can interact: move forward, turn left, right, look at tree tops. Make a whole tour around the park. 92 pictures. - • William Kent and ( new at that time ) US national park policy. Otherwise this valley might be logged or/and flooded. Current problems with tourist access or how millions are wasted - Marine Independent Journal. John Muir was a founder of Sierra Club. Muir Woods is one of the most visited attractions to experience California nature. Located conveniently close San Francisco across the Golden Gate Bridge, it is as wild as if you are far away. At the same time it is well developed and has all comforts of civilization. If you want you can spend hours and even days wondering around this Mount Tamalpais area enjoying trails and breathtaking views. Muir Beach and Pelican Inn restaurant are just a minute away. Muir Woods is overcrowded, especially on weekends. Consider a bus. Directions and public transportation options. Here are other virtual tours of nearby places which is worth to visit in the same day as Muir Woods: Golden Gate Bridge views from Hawk Hill. Feeling lucky? Browse around National Parks..
Copyright©2004 Yes San Francisco, LLC. All Rights Reserved.